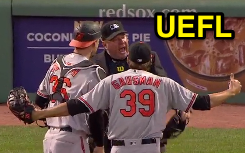 HP Umpire Sam Holbrook ejected Orioles pitcher Kevin Gausman (Throwing At Red Sox batter Xander Bogaerts) in the bottom of the 2nd and Orioles CF Adam Jones (Balls/Strikes) in the 5th inning of the Orioles-Red Sox game. In the 2nd, with none out and none on, Bogaerts took a first-pitch slider from Gausman for a hit-by-pitch. Replays indicate the pitch was located 23.7 inches inside and hip-high, the call was irrecusable. Bogaerts was the first hit batsman of Wednesday's game, and second of the three-game series (Red Sox batter Rookie Betts received a HBP from Orioles pitcher Dylan Bundy on Monday; Chris Sale threw behind Manny Machado on Tuesday, after which MLB Commissioner Rob Manfred warned both teams not to throw at each other). At the time of Gausman's ejection, the game was tied, 0-0. In the 5th, with one out and one on, Jones took a 1-2 fastball from Red Sox pitcher Drew Pomeranz before striking out swinging on the ensuing pitch. Replays indicate the pitch was located over outer edge of home plate and above the midpoint (px .808, pz 3.556 [sz_top 3.411 / MOE 3.494]), the call was incorrect. At the time of Jones' ejection, the Red Sox were leading, 4-0. The Red Sox ultimately won the contest, 4-2. This is Sam Holbrook (34)'s first ejection of the 2017 MLB regular season. Sam Holbrook now has -4 points in the UEFL Standings (-4 Previous + 2*[2 MLB] - 4 Incorrect = -4). Crew Chief Sam Holbrook now has 0 points in Crew Division (-1 Previous + 1 Irrecusable Call = 0). This is the 22nd, 23rd ejection report of 2017. This is the 8th player ejection of 2017. Prior to ejection, Gausman's line was 1.0 IP, ER, BB, HBP. This is the 9th player ejection of 2017. Prior to ejection, Jones was 0-3 (SO) in the contest. This is Baltimore's 2nd/3rd ejection of 2017, 1st in the AL East (BAL 3; BOS, TB, TOR 2; NYY 0). This is Kevin Gausman's first career MLB ejection. 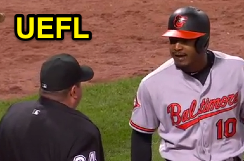 This is Adam Jones' first career MLB ejection. This is Sam Holbrook's first ejection since July 20, 2016 (Clint Hurdle; QOC = Y [Foul/Interference]). Wrap: Baltimore Orioles vs. Boston Red Sox, 5/3/17 | Video via "Read More"